Waterfalls are one of the most beautiful creations of nature, and Hyderabad is blessed to be bestowed with several such waterfalls all around that flow through valleys, cascading down the rocky cliffs. In fact, your trip to Hyderabad would become a lot memorable by visiting these roaring landmarks that have awed even the most hard-to-please, with their sheer beauty and magnificence. So, the next time you are in the City of Nizams, don’t just be content with the mouth-watering dishes and the architectural marvels that it has to offer. Plan your itinerary in a way so that you have at least a day or two to unwind, relax and enjoy the panoramic views of nature from here. But, before you plan your trip and book a hotel in Hyderabad, let us quickly run you through the list of the surreal waterfalls near Hyderabad. 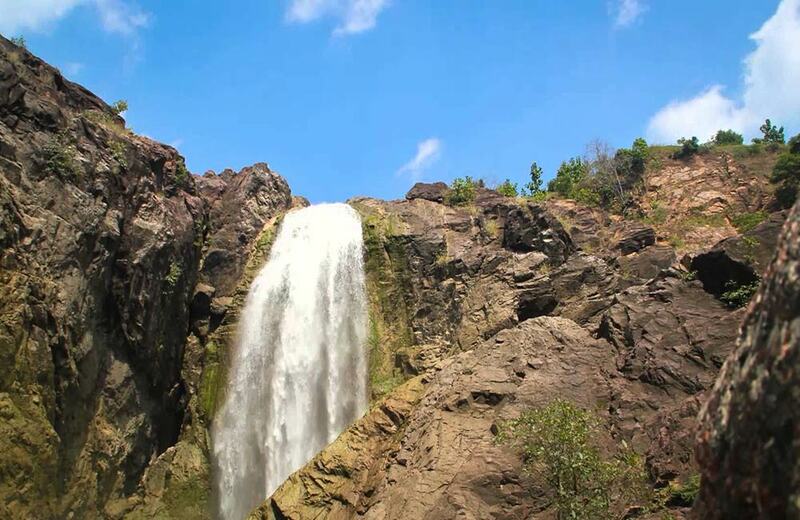 Ethipothala Waterfall is certainly one of the most striking waterfalls around Hyderabad. It is formed by three mountain streams – Chandravanka Vagu, Tummala Vagu and Nakka Vagu that fall from a height of around 70 feet. The sight of the water falling into the lagoon is a treat for the senses. If you want to get close to the falls, you can climb down the steps. At the foot are two temples, namely Dattatreya Temple and Ranganadha Swami Temple that add a spiritual touch to it. As the waterfall is located in a serene, secluded location, it is ideal for those who love to camp in the lap of nature as well as light trekking. Apart from that, you can also visit the crocodile breeding center that is right inside the pool or the prehistoric caves that extend to Srisailam. 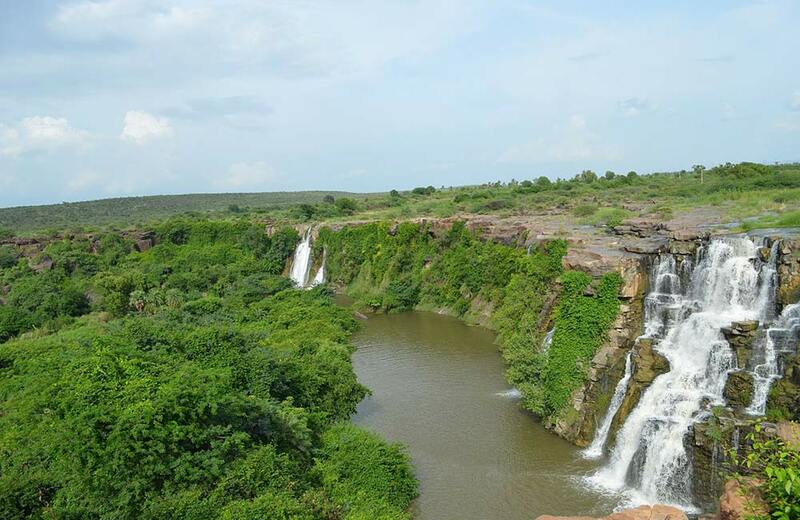 You can reach the falls by road via Nagarjuna Sagar that is around 15v km from the site. 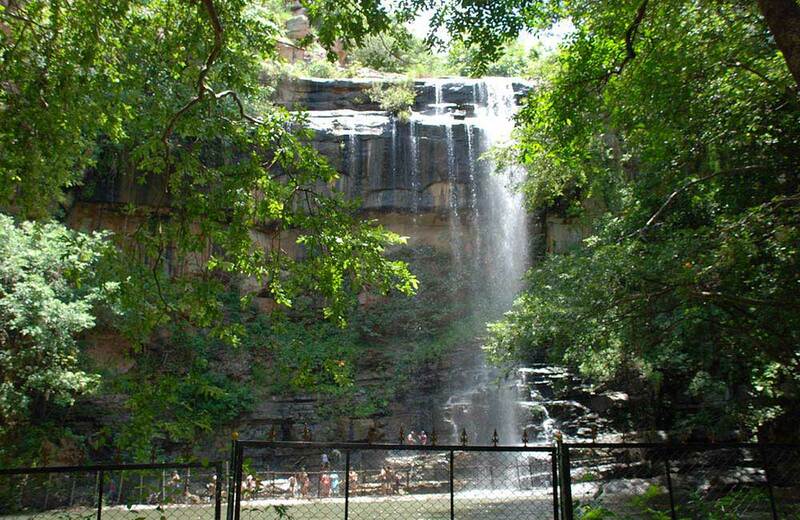 Located in the dense Nallamala Forest, Mallela Theertham Waterfall is a true gift of nature. The water that flows through the dense forest runs down with all its energy, falling directly on rocks that look like Shivling from a height of around 150 feet. Watching this amazing sight of water fall on a ‘Shivling’, with the Nallamala Forest, among the longest stretch of deciduous trees in southern India, in the background, is a treat for the eyes. As the legend goes, Lord Shiva appeared to his devotees on several occasion at this very place. The falls are also believed to be a water drinking spot for tigers during summer. If you are an adventure seeker, you would be happy to know that the site offers activities such as trekking, river crossing and camping. Mallela Theertham Waterfalls are located near the Srisailam Dam. If you are traveling by road, then on your way to Srisailam, you will come across a village by the name of Vatvarlapally. It is around 30 km from Mannanur forest check post. On reaching the village, take a left and drive for around 8 km to reach the waterfall. 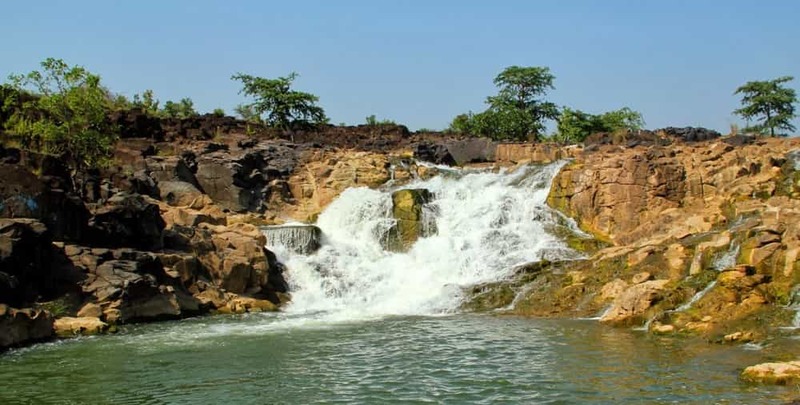 Located in Gudur in Warangal District of state of Telangana, the 70 feet high Bheemuni Waterfall is one of the most picturesque in the region. It offers a scenic escapade from the hectic city life. If you happen to visit the waterfall during sunrise or sunset, you will get to witness the majestic sight of water shining in rainbow colors. The waterfall derives its name from a rock shaped like a footprint, associated in legends with Bhima. There are a number of pristine lakes located around the waterfall. And, though the Bheemuni Paadam Waterfall, unlike other waterfalls, does not have several temples nearby, it does have a small, yet popular, enclosure that houses the idols of Lord Shiva and Nagadevatha. A 10-km long cave is another popular tourist attraction in this region. Take a bus from Hyderabad to Gudur, and after reaching Gudur bus stand, hire a taxi to reach the waterfalls. Pochera Falls is a must visit if you are planning a day of fun and relaxation in the area. One of the most popular tourist destinations near Hyderabad, it is located on the Kadem River. Surrounded by surrounded by lush green forests that are home to several animal and bird species, it is also a great spot for wildlife tours and hikes. The sight of water flowing over a series of rocky steps before it finally descends from a height of 40 feet into the pool below will surely leave you awe-struck. However, we advise you not to even think of taking a dip into the pool because it’s quite deep. 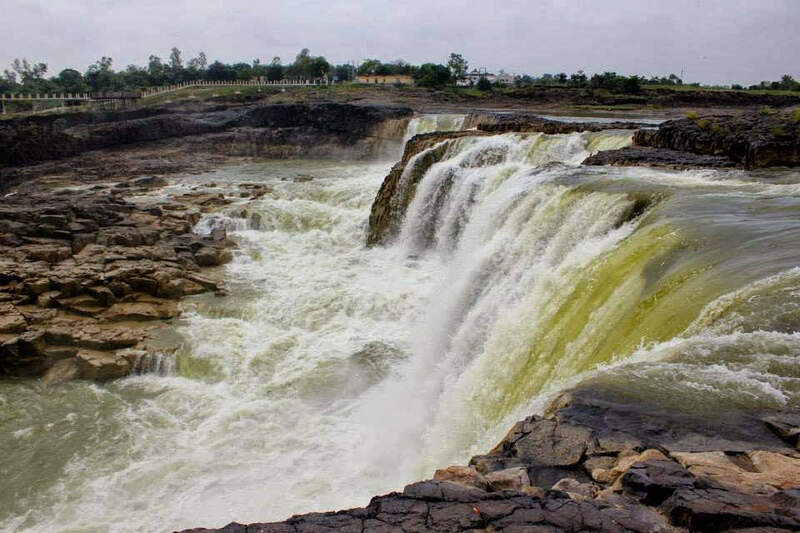 In fact, the Pochera Falls is the deepest of all the waterfalls in the state of Telangana. If you are planning to travel by road, the good news is that the condition of the road from Hyderabad to Pochera is great. There are two routes to reach Pochera Falls – the first is via Nirmal that is around 43 km from the falls, and the second route is via Adilabad that is around 55 km away. The nearest railway station is Adilabad Railway Station; therefore, the option to travel by train is also available. Falling from a height of 147 feet (200 feet as per some accounts), Kuntala Waterfall is the highest one in Telangana. It is located on the Kadem River in the Adilabad district. The waterfall is surrounded by thick forests imparting it a surreal view that tourists fall in love with as soon as they reach it. It is around 10 minutes’ walk from the entry point, and if you want to reach the bottom of the waterfall, you need to climb down around 400 steps. Here’s an interesting fact about Kuntala Waterfall…it derives its name Kuntala from Shakuntala, the wife of King Dushyanth. And, as the legend goes, Shakuntala used to bathe in this waterfall, and it was here the duo fell in love with each other. If you are relying on public transport, you can take a bus to Neredigonda village. From here, you need to hire a private taxi to reach Kuntala. The nearest railway station is Adilabad Railway Station, around 67 km away. If you are looking for a waterfall that is frequented by lesser number of visitors, then you must visit Gayathri Waterfall, located in a secluded place near Tarnam Khurd village. 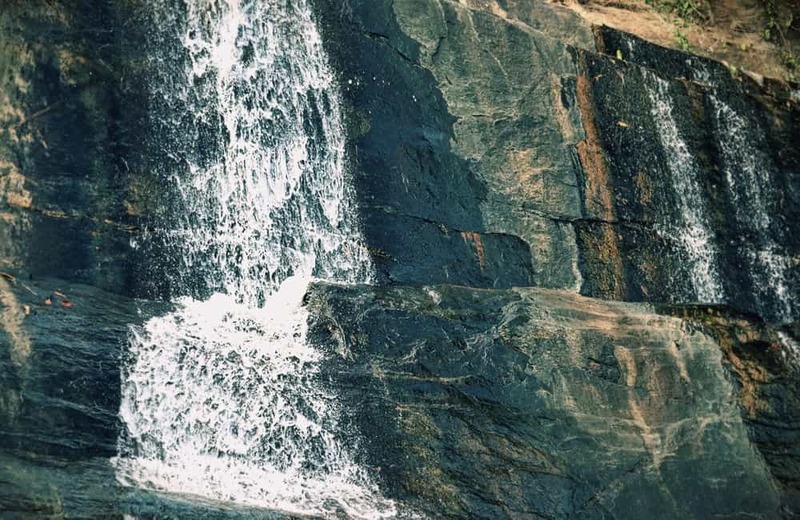 And although it is a relatively less popular waterfall as compared to its neighboring Kuntala Waterfalls, it is by no means less beautiful than the former. Gayathri Waterfall, also known as Mukti Gundam or Gadidha Gundam, is a treat for nature lovers, who would fall in love with the magnificent sight of the water falling from a height of 100 feet. If you want, you can swim in the pool at the bottom of the waterfall. Trekking to the waterfall is also an option; however, we would advise you to not do it if you are with kids. Also, make sure you have a guide accompanying you to avoid getting lost in the dense jungles. The best way to reach Gayathri falls is to first reach Tarnam Khurd village via Neredigonda. Once you reach Tarnam Khurd, you need to get off your vehicle and trek to the falls. The distance between the village and the fall is around 5 km. There’s an alternate route too from Ichoda to Tarnam Buzurg. However, the route is not recommended during the peak monsoon season as the roads get pretty messy and inaccessible during that time. Situated in the Jayashankar Bhupalpally district of Telangana, the Bogatha Falls is often referred to as the Niagara of Telangana because of its magnificent size and serene surroundings. In fact, the thundering sound of the water hitting the rocks can be heard from a few kilometers away. Another interesting fact about this fall is that it is the second biggest in the state by some measurements. Bogatha Falls is a favorite among the residents of the nearby villages, who frequent it to take a dip in the pool. Swimming is considered safe here as the pool is not too deep. There’s also a temple near the falls, which is dedicated to Bogateswara Swamy. You can reach Bogatha Waterfall via Bhadrachalam that is situated around 288 km from Hyderabad. From Bhadrachalam, you need to drive to village Koyaveerapuram G, from where you need to trek as the road is not apt for vehicles beyond that point. Craving for a visit to these stunning marvels of nature? We bet that after going through this post, you would be longing to visit these gorgeous waterfalls. So, what are you waiting for? Simply pack your bags, take some time out and go on a short trip to unwind from your hectic work life and reconnect with nature. Kanakai Waterfall, also known as Kanakadurga Waterfalls, is located on the Kadem River in Adilabad. The tranquil waterfall is a must visit for people, looking to spend some time amidst nature. And the best thing is that there are two other waterfalls situated in the area – Bandrev Falls and Cheekati Gundam Falls that can be visited the same day. 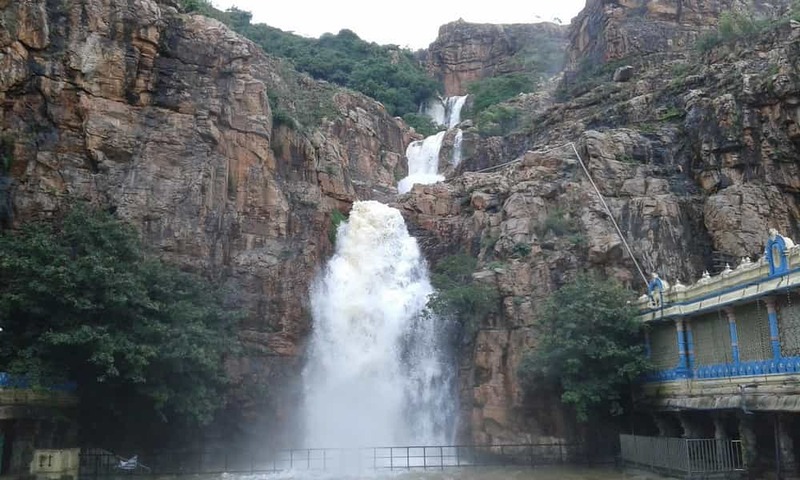 Besides being a popular tourist getaway among those yearning for a break from the city’s hustle and bustle, Kanakai Waterfall is also known among devotees frequenting the nearby Kanaka Durga Temple. And that’s not all; the place also offers great trekking opportunities to adventure lovers. 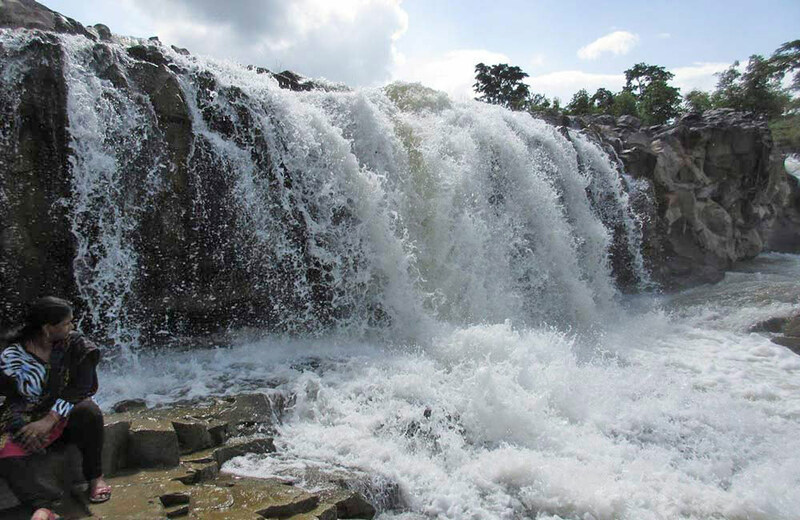 Kanakai Waterfall is located near Girnur village. If you are driving from Hyderabad, you first need to reach Ichoda and then take a left turn, and drive towards Bazarhatnoor to reach Girnur. From Girnur village, you can hire a guide to walk you to the waterfalls and temple that are around 1.5 km away. Located on the Penganga River, Sahastrakund Waterfall is an idyllic destination to recuperate in the lap of nature. It is surrounded by unique rock patterns that show nature’s craftsmanship in the best light. 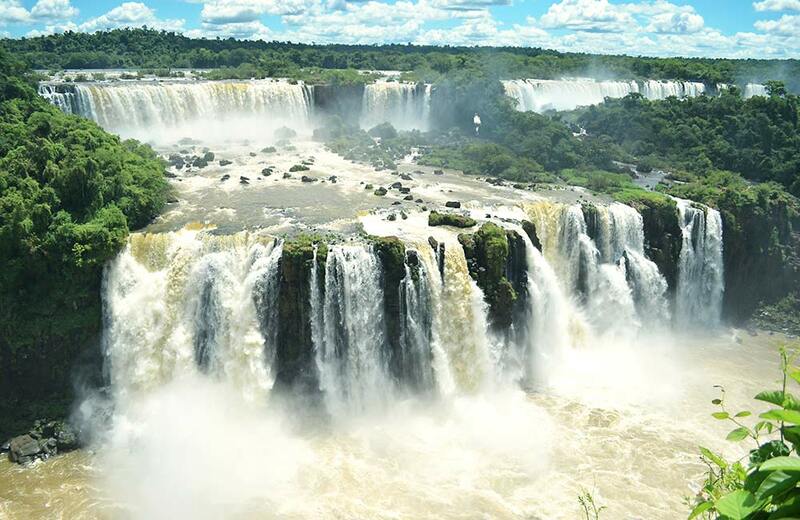 Watching the water ‘fall’ from a height of 50 feet, on one-of-its-kind black stones, is one of the most enthralling scenes you would have ever seen. To get the best view, climb onto a ramp that’s located on one side of the waterfall. If you happen to visit Sahastrakund Falls, also explore the nearby temples to seek divine blessings. There are three major temples near Sahastrakund Falls – Banganga Mahadev Temple, Panchamukhi Mahadev Temple, and Ram Temple. From Hyderabad, take a train to Sahastrakund Railway Station, and from here, you take a bus to the waterfall. You can also take a bus to Nirmal, located 217 km from Hyderabad. From Nirmal, you need to change to another bus to reach Sahastrakund Fall. 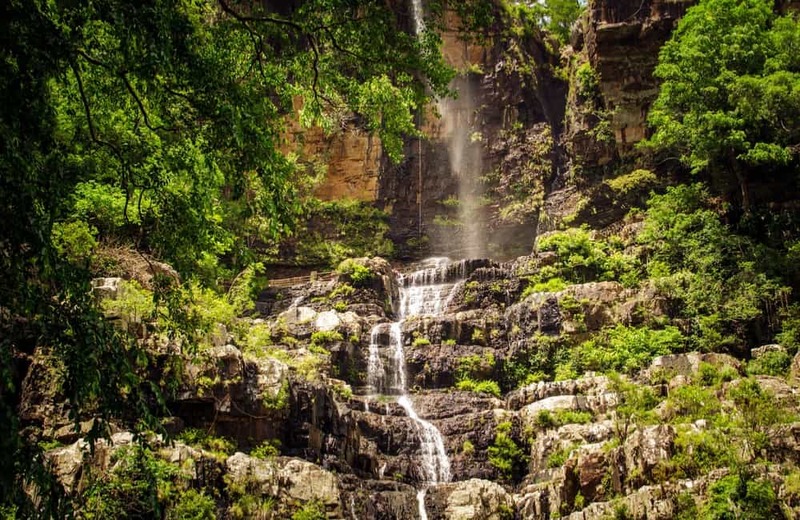 Located in Sri Venkateswara National Park in the Chittoor District of Andhra Pradesh, the 270 feet high Talakona Waterfalls are the highest in Andhra Pradesh. Besides the height, what’s unique about the waterfall is the fact that its water is said to have healing powers because of its high mineral content. The area around Talakona Waterfall is also home to some of the rarest species of flora and fauna, which makes it perfect for wildlife enthusiasts as well. Talakona falls, apart from being a nature lovers’ paradise, is also a place of spiritual significance. The revered Siddheswara Swamy Temple, located nearby, is frequented by several devotees all throughout the year. There are various ways to reach Talakona from Hyderabad. If your priority is to save time, take a flight to Tirupati or Cuddapah (Kadapa). From there, you need to hire a taxi to reach the waterfall. You can also take a train to Koduru and then take a cab from the station. Situated inside the premises of Kapila Theertham Temple, Kapila Theertham Waterfall drops from a height of 100 feet into a pond There’s an interesting story behind how the temple got its name. It is believed that Lord Shiva appeared to one of his devotees, Saint Kapila Maharishi, who lived and worshipped him, here. Since then, the locals have referred to the waterfall and its surrounding areas as Kapila Theertham. If you want to seek the blessings of Lord Venkateshwara, trek to the fourth cave above the waterfall that houses his idol. The serenity surrounding the waterfall provides the perfect setting to contemplate important life decisions. Tirupati is the nearest railway station to Kapila Waterfalls. After reaching the railhead, you need to hire a taxi to reach Kapila Theertham. 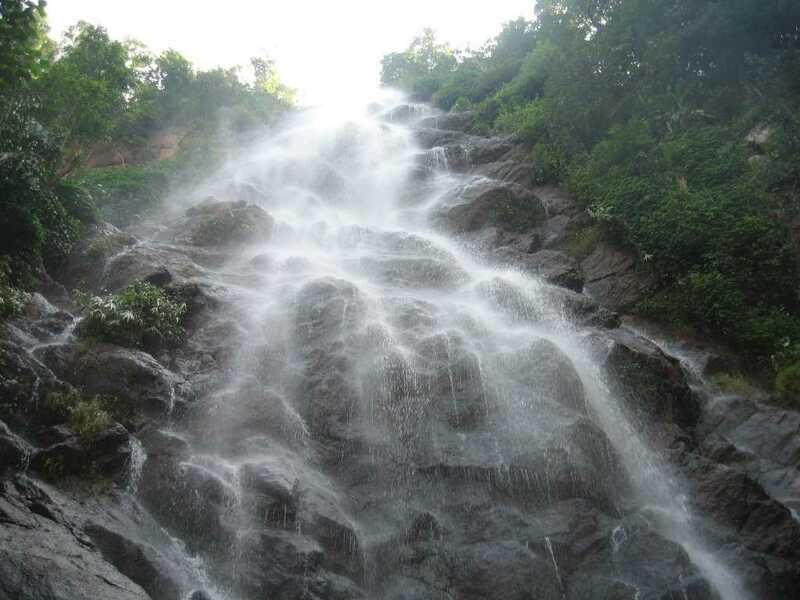 Tadimada Waterfall, also known as Ananthagiri Waterfalls, is located around 3 km from Ananthagiri, a small village in Vizag District of Andhra Pradesh. The waterfall is surrounded by lush greenery that adds to its beauty. One of the most beautiful tourist spots in Araku and nearby regions, it is ideal for a picnic with friends and family. Watching the water fall from a height of 100 feet during the monsoon is a visual treat. And though you might be tempted to take a dip after watching the locals swim, it is advisable to avoid doing so because the water is not very clean. The fall is located 1-2 km from the main road between Araku Valley and Ananthagiri; however, as the approach road to the fall is not in good shape, it is advisable to either travel by SUV, or trek/walk. Hire a taxi or take a bus from Hyderabad to reach Ananthagiri. Cover the 3 km distance (from Ananthagiri to Tadimada) on foot. Alternatively, you can take a train or flight from Hyderabad to Visakhapatnam and then head to Ananthagiri town by road. Formed by the Gosthani River, Katiki Waterfall derives its name from a nearby village, named Katiki. 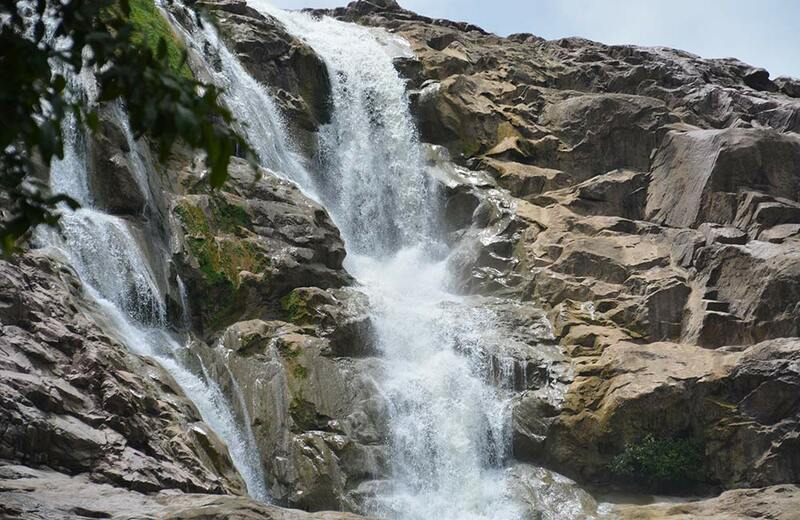 Located in the Visakhapatnam district of Andhra Pradesh, it is one of the most pristine waterfalls in the region. As the waterfall is located inside thick greens, you will have to undertake a 2 km trek through the forest to reach it. Once you are there, climb the summit, splash in the cool blue water, and get mesmerized by the beauty of the falls and its surroundings. The famous Borra Caves, one of the largest caves in India, are located just 2.4 km from the waterfall. 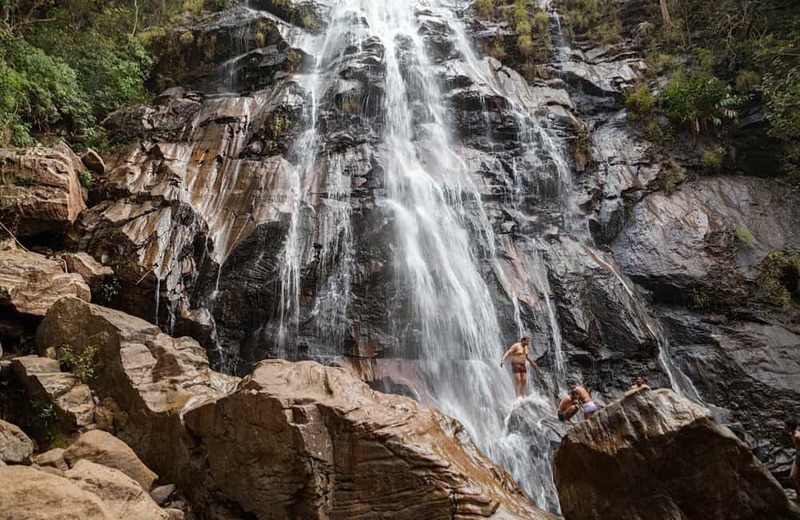 A visit to Katiki waterfall is, therefore, your opportunity to strike off more than one destination from your list of must-visit places in the country. Some other areas of interest close to the waterfalls are Tyda Park and Araku Tribal Museum. If you have an undying love for nature, you can trek amidst acres of greenery covering the region that will provide enough sights to treat your soul. Take a state bus to reach Araku from Hyderabad. After arriving in Araku, take Borra Caves Road to reach Tunnel Number 44. The road ends here, and you will have to cover the remaining distance on foot.